Paul Aigbogun has been appointed as the new coach of Nigerian champions Enyimba, replacing Kadiri Ikhana who led the club to their historic seventh league title last year. Aigbogun returns to the Aba-based outfit where he previously worked as assistant coach to Salisu Yusuf in 2013. "Enyimba Football Club can confirm that coach Paul Aigbogun has been appointed as the new Technical Adviser," club spokesman Farriel Allaputa told BBC Sport. "The management, players and staff are pleased to have Paul back as head coach because he not only has top-level experience, he is equally familiar with our club and shares our passion and ideals. "In his previous spell as assistant coach in 2013 when we won our third Federation Cup, he stood out as a thorough professional, one that is as driven as we are for glory and success. "We are very confident he can guide the team to great heights and we will give him all the support he needs to succeed," Allaputa added. Aigbogun guided Warri Wolves to second spot behind Enyimba in the 2015 Nigerian season and sealed a Caf Champions League place for the Delta State club. But he will be hoping to emulate his illustrious predecessor in the local scene and continental campaign. 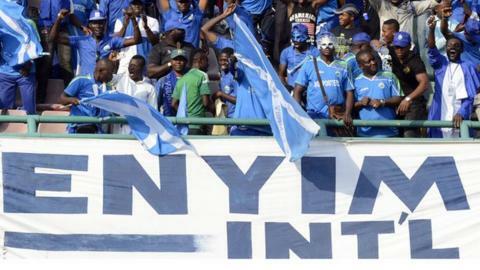 Veteran Ikhana, who has previously managed Nigeria's U-23 side and the women's national team, led two-times African champions Enyimba to their maiden African Champions League title in 2003.